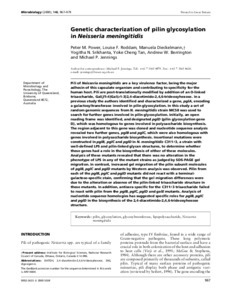 Pili of Neisseria meningitidis are a key virulence factor, being the major adhesin of this capsulate organism and contributing to specificity for the human host. Pili are post-translationally modified by addition of an O-linked trisaccharide, Gal(β1-4)Gal(α1-3)2,4-diacetimido-2,4,6-trideoxyhexose. In a previous study the authors identified and characterized a gene, pglA, encoding a galactosyltransferase involved in pilin glycosylation. In this study a set of random genomic sequences from N. meningitidis strain MC58 was used to search for further genes involved in pilin glycosylation. Initially, an open reading frame was identified, and designated pglD (pilin glycosylation gene D), which was homologous to genes involved in polysaccharide biosynthesis. The region adjacent to this gene was cloned and nucleotide sequence analysis revealed two further genes, pglB and pglC, which were also homologous with genes involved in polysaccharide biosynthesis. Insertional mutations were constructed in pglB, pglC and pglD in N. meningitidis C311#3, a strain with well-defined LPS and pilin-linked glycan structures, to determine whether these genes had a role in the biosynthesis of either of these molecules. Analysis of these mutants revealed that there was no alteration in the phenotype of LPS in any of the mutant strains as judged by SDS-PAGE gel migration. In contrast, increased gel migration of the pilin subunit molecules of pglB, pglC and pglD mutants by Western analysis was observed. Pilin from each of the pglB, pglC and pglD mutants did not react with a terminal-galactose-specific stain, confirming that the gel migration differences were due to the alteration or absence of the pilin-linked trisaccharide structure in these mutants. In addition, antisera specific for the C311#3 trisaccharide failed to react with pilin from the pglB, pglC, pglD and galE mutants. Analysis of nucleotide sequence homologies has suggested specific roles for pglB, pglC and pglD in the biosynthesis of the 2,4-diacetimido-2,4,6-trideoxyhexose structure.